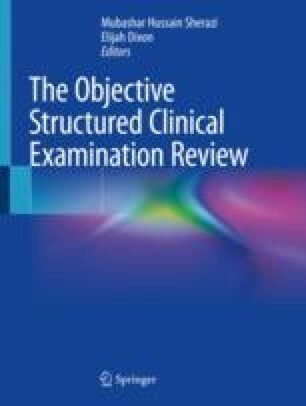 Since it was described in 1975, the objective structured clinical examination (OSCE) has evolved into a modern testing tool for the evaluation of the clinical skills of physicians and medical students. The OSCE has been integrated into the licensing and evaluating examination systems of medical education and licensing authorities around the world. The OSCE uses standardized patients. The examiner either observes in person or the scenarios are recorded for the examiners to later watch the interaction between the candidate and the standardized patients. The candidates are assessed throughout the station from entering into the room till they finish the station and leave the room. Medical Council of Canada Qualifying Examination Part II. http://mcc.ca/examinations/mccqe-part-ii/. Accessed 2 Apr 2018. Medical Council of Canada. National assessment collaboration examination. http://mcc.ca/examinations/nac-overview/. Accessed 2 Apr 2018. Medical Council of Canada. Practice-ready assessment. http://mcc.ca/projects-collaborations/practice-ready-assessment/. Accessed 2 Apr 2018. USMLE Step 2 CS. http://www.usmle.org/step-2-cs/. Accessed 2 Apr 2018. General Medical Council. What is the PLAB 1 exam? https://www.gmc-uk.org/doctors/plab/23453.asp. Accessed 2 Apr 2018. Membership of Royal College of General Practitioners. MRCGP Clinical Skills Assessment (CSA). http://www.rcgp.org.uk/training-exams/mrcgp-exams-overview/mrcgp-clinical-skills-assessment-csa.aspx Accessed 2 Apr 2018. Australian Medical Council Limited. AMC clinical examination. https://www.amc.org.au/assessment/clinical-exam. Accessed 2 Apr 2018. Royal College of Physicians and Surgeons of Canada. Scholar definition. http://www.royalcollege.ca/rcsite/canmeds/framework/canmeds-role-scholar-e. Accessed 2 Apr 2018.